You are here: Home ∼ 2010 ∼ December ∼ 26 ∼ Toddy Coffee! Prepare yourself for the honest to goodness World’s Best Cup of Coffee! A few months ago, my good friend Mehran was telling my husband and I about this amazing cold brew system coffee maker that he recently discovered. He just raved about it and I was intrigued. Time went by and my hubby must have kind of forgotten about it, but, it was still lurking in my mind. What is this amazing system that Mehran was so OBSESSED with? I knew that Chris would love it so I placed my order on Amazon a few weeks before Christmas in the hopes that he would be surprised by this awesome gift. He was!!! I made him open it after Christmas Eve dinner and he was so excited! And skeptical at the same time. We have quite a few coffee makers around this apartment (regular coffee maker, french press, Keurig…) and I could tell he wondered why on Earth we would need another one! We brewed the coffee overnight, as per the instructions, and woke up on Christmas morning to the smoothest cup of coffee that has ever passed our lips! Thank you, Mehran! 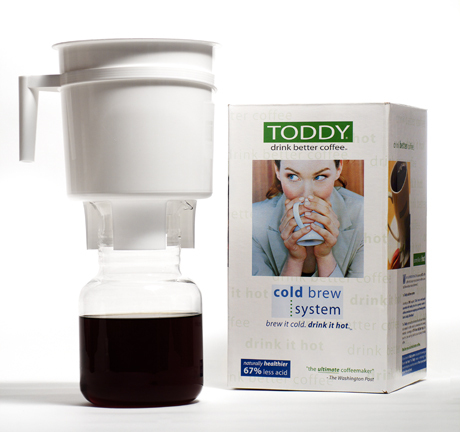 The Toddy is an interesting system that brews your coffee at room temperature and is said to cut 67% of the acidity of normal coffee. It does. Ok, you know that residue that is left at the bottom of your cup when you are almost finished with your coffee? That dark brown, tar-ish, dirty looking gunk that lingers? Well, with the Toddy there is NONE of that! NONE!!! It makes a perfectly clean, velvety smooth cup of coffee! It blows my mind. I know I sound a bit dramatic but try it. Another great thing is that you can make it as strong or weak as you like… iced or hot… regular or decaf. What you are actually brewing is somewhat of a coffee concentrate. You can drink it straight or add water. They recommend 1 part coffee concentrate to 3 parts water, which can be either hot or iced. They are both magnificent! Play around with it until you discover the cup that is perfect for you. It lasts for up to 2 weeks in your refrigerator and is ready to give you that invigorating and relaxing, put a smile on your face, time stopping cup of coffee whenever you want it. OOO MMM GGG So EXTREMELY and COMPLETELY OBSESSED!